Are those turkeys? Thigh high, bigger than a Thanksgiving dinner plate, and sporting talons long enough to carve themselves, sure enough two young turkeys were fighting near the park entrance on my first trip to Cowpens National Battlefield. Not what I was expecting of a Revolutionary War site, but then Cowpens is not your average tourist stop. This 842-acre escape from the rush of the highway chronicles an important saga in America's struggle for independence and commemorates a decisive battle that helped turn the tide of war in the Southern Campaign of the American Revolution. In front of the visitor center, the towering U.S. Monument, built in 1932, honors American and British troops who fought here. 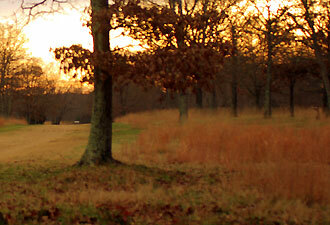 Inside, an 18-minute movie, “Cowpens: A Battle Remembered,” brings the conflict to life. A fiber-optic map helps visitors understand the Southern Campaign through whirls of colored lights. The museum, which doubles as auditorium, displays original weapons and artifacts from the Revolutionary War and reproduction 3-pounder cannon. Visitors can gain the lay of the land by walking the 1.3-mile battlefield trail that meanders through a landscape restored to its 1781 appearance. Wayside exhibits detail the Americans' journey to the cow pens and their positions on the battlefield, the British push through the night, the morning clash, and the resounding American victory. The trail leads past the Washington Light Infantry Monument, erected in 1856, where the hardest part of the fighting took place. This monument honors the valor of American cavalry commander Lieutenant Colonel William Washington and his men. On that first visit, I ventured on to the three-mile loop road that skirts the perimeter of the battlefield. I discovered a great picnic area, complete with covered shelter. From here, a two-mile nature trail offers visitors a tranquil setting to look for deer, coyotes, and of course, more turkeys, while squirrels tussle in the shade of sweet gum, oak, and hickory trees. 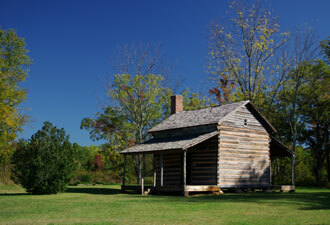 Farther along the loop road, a restored 1828 log cabin known as the Scruggs House offers a glimpse of nineteenth-century living. I marvel that as many as 11 children competed for space with their parents in this two-room cabin and farmed the nearby cotton fields. The last stop along the loop road is the field where American troops led by Brigadier General Daniel Morgan camped the night before battle. It serves as a reminder of the fortitude required of the men who fought for our freedom that cold day in January 1781. 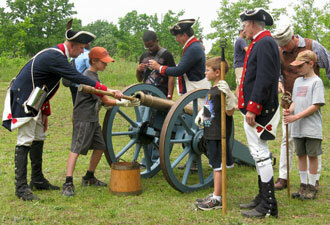 Cowpens National Battlefield hosts special events, encampments, and other activities throughout the year. Annual events include the battle anniversary celebration on the weekend closest to January 17, the Celebration of Freedom in July, and the Upstate Revolutionary War Weekend in October. Just one hour south of Charlotte, North Carolina; 25 minutes north of Spartanburg, South Carolina; and an hour east of Asheville, North Carolina, Cowpens National Battlefield is easily accessible from I-85 and I-26. Spend the day, walk the fields, and escape the rush of the highway.